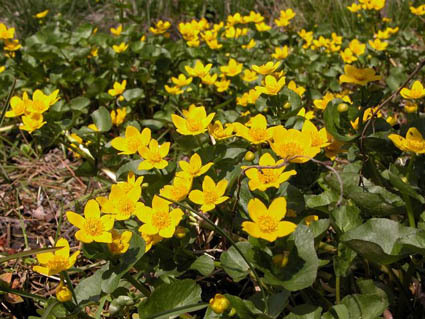 In spring time the beautifull yellow flowers of Caltha palustris (picture below) dominate the rich fens. Also the white flowers with a touch of purple of Cardamine pratensis can be seen. But else there are not much to see in the spring in the fens because the water-saturated ground only warms up slowly. By the end of May and during June it is the most beautifull time in the fens. 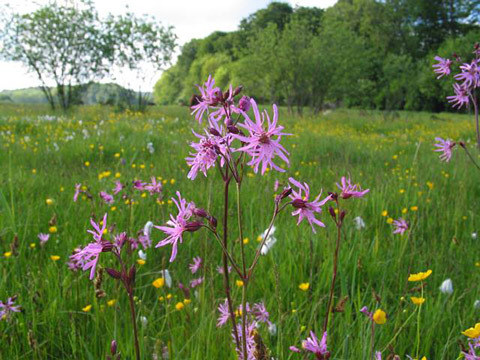 A lot of different plants are flowering among them the elegant Lychnis flos-cuculi (picture above). 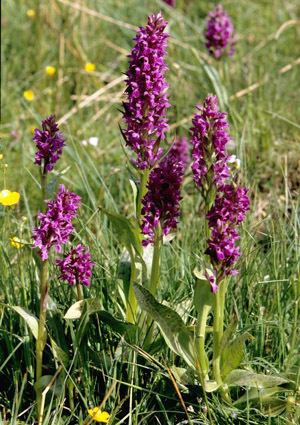 Other common species are Ranunculus repens, Myosotis scorpioides, Prunella vulgaris, Ajuga reptans, Geum rivale, Viola palustris and the more infrequent Pedicularis palustris, Trollius europaeus and Valeriana dioica. Many grasses, sedges and rushes are charactestic as Anthoxanthum odoratum, Poa trivialis, Poa pratensis, Festuca rubra, Cynosurus cristatus, Briza media, Carex acutiformis, Carex rostrata, Carex panicea, Carex nigra, Carex paniculata, Carex disticha, Eriophorum angustifolium, Juncus effusus, Juncus articulatus and Luzula campestris. During the summer several other species arer flowering. At this time it is often higher growing species as Cirsium palustre, Cirsium oleraceum, Valeriana sambucifolia ssp. procurrens, Epilobium hirsutum, Filipendula ulmaria, Angelica sylvestris, Peucedanum palustre and large grasses as Deschamsia caespitosa and Calamagrostis canescens. Back to The river vallleys in Eastern Jutland - the fens.